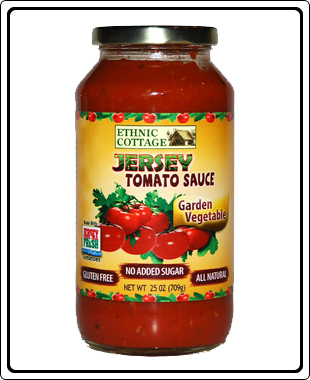 Ethnic Cottage Garden Vegetable Pasta sauce is packed full of Jersey Fresh Tomatoes, onions, zucchini, carrots, and mushrooms. Seasoned mildly it has all the flavor and healthy benefits of vegetables. Ethnic Cottage’s Garden Vegetable Pasta Sauce makes a hearty and healthy meal when spooned over pasta, couscous or risotto. Ingredients : Vine Ripened Jersey Tomatoes, Onions, Mushrooms, Zucchini, Carrots, Extra Virgin Olive Oil, Fresh Garlic, Fresh Basil, Sea Salt, Fresh Oregano, Crushed Red Pepper, and Black pepper. Copyright © 2018 Ethnic Cottage Foods. All Rights Reserved.